Our plan: spend nine days seeing all five national parks in Utah starting in the southwest corner with Zion and Bryce, then a day in Capital Reef, and ending in Moab to see Arches and Canyonlands. I will spare you the anticipation and say we had to reel in our plans after running into engine coolant challenges, but we managed to hit three of the five in twelve days. As you approach southern Utah, the geography rapidly shifts to the classic red rock sandstone derived from the high iron content, and our excitement and energy grew with each mile. 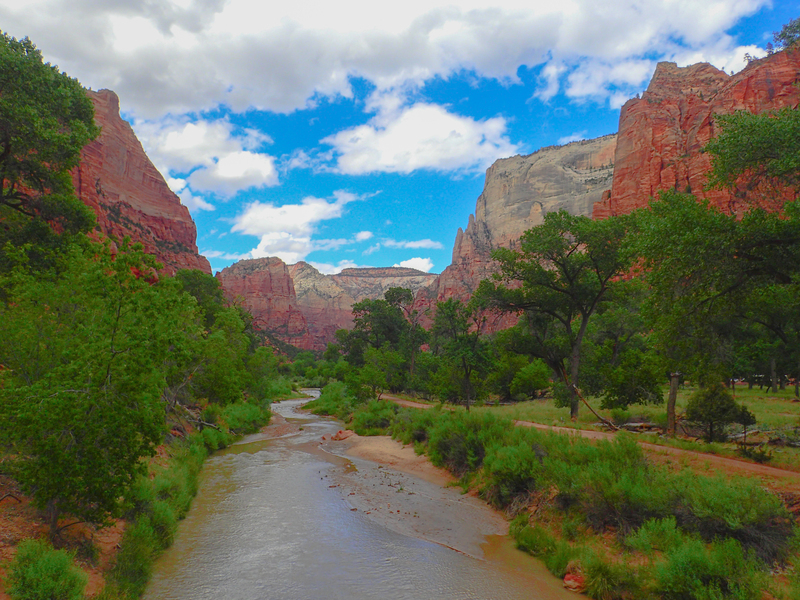 Zion is set up perfect for those of us without a tow vehicle, with not only a park shuttle hitting many scenic areas, learning centers, and trail heads, but also a free town shuttle that stops near most of the hotels and RV parks. 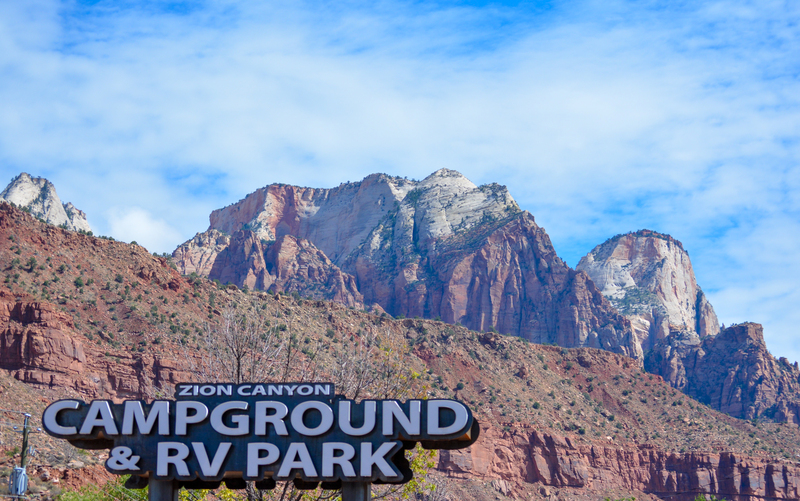 We were fortunate enough to get late reservations at Zion Canyon RV Campground and RV Resort, the private, full hook up campground less than half a mile from the Zion National Park visitor center. The sites were gravel and dirt with some trees interspersed, not particularly spacious but not the total sardine cans we have seen in some places, and we had a fantastic view of The Watchman looming directly over the camp. Zion Canyon River had available showers and a pool packed with families and kids, to be expected since the place was nearly full during our stay. The facilities were clean, and the staff extremely helpful in getting us situated, providing directions and recommendations, and dealing with some mail forwarding problems we experienced during and after our stay. We weren’t there for a resort experience, however, and the main draw of this RV park is the location, right next to the town shuttle stop leading into the park, or only .4 miles to the visitor center if you prefer to walk it. Since we planned plenty of day hiking in the national park itself, we elected for the former option. During our four day stay we hit the visitor center, human history museum, the lodge, every scenic lookout, and a good number of the shorter trails. We got to hike a small part of the famous Narrows during our first full day, with good timing since that evening the area experienced heavy rain with flash flood warnings, a potential catastrophe if you are caught in any of the slot canyons. We split up or one afternoon to hike different options, Rosie seeing no fun in staggering up the Angels Landing trail, whereas I was basically shamed into doing it via a pointedly worded text from my dad who had hiked it during his visit. The strenuous trail ends with half a mile of cliffside scrambling while looking down thousand foot drop offs in several locations. Not for those with fear of heights, but the rewarding views at the end was worth it. 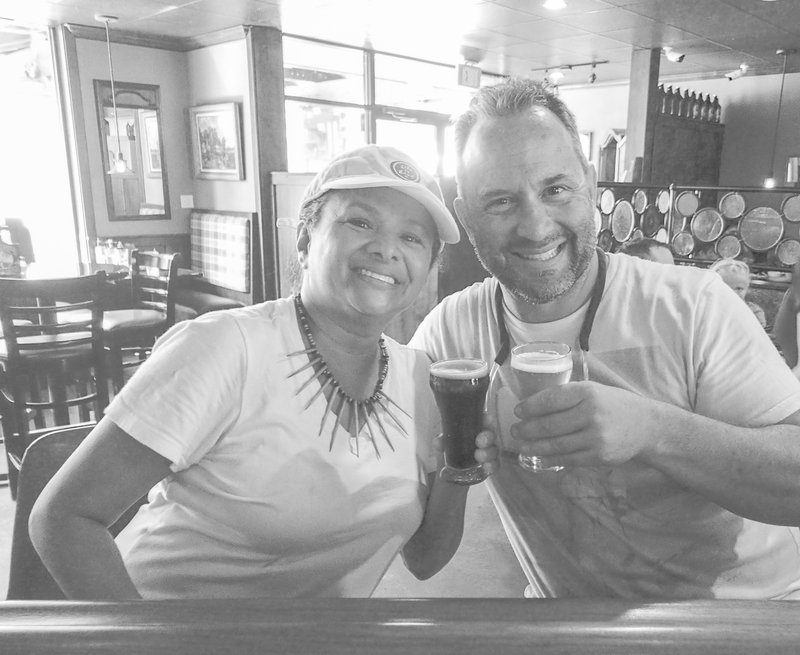 We met up at beer pub right next to the visitor center for some local craft beer. There is a weird Utah or perhaps local law requiring the purchase of food with alcohol, so the place had really cheap but delicious bread sticks with spicy beer cheese dip as an appetizer, allowing affordable compliance with the odd rule. We also enjoyed walking throughout the touristy but cute little town running down the main drag, easily accessible from the handful of bus stop on the free shuttle. Though we kept our expenses down by avoiding restaurant eating, we spent a fair share of our time in the boutique shops, and I bit the bullet and bought some higher end hiking boots since my discount sketchers just weren’t cutting it. Zion is fantastic for any visitor, but for us it was beyond wonderful. We would love to return in a future year, hopefully with fewer crowds in the park and perhaps during cooler weather, but unlike our other “we want to come back but with a tow vehicle next time,” Zion requires no such caveat.